You may find this trick helpful to prepare the most even-shaped, flat burger patties. To avoid a saucer-shaped patty, make an indent with your thumb in the centre of your raw patty. When meat cooks it contracts, so the edges of the burger tighten and the middle swells. By making a hollow in the middle of the burger it helps the meat cook evenly, maintaining its shape as it shrinks during cooking! Chop the potato into wedges about the size of your index finger (no need to peel). Pop the wedges on a lined baking tray, drizzle over some oil, a pinch of salt and half the dried thyme. Give the tray a good shake and then put on the top shelf of your oven. Cook for 25-30 mins, or until golden and crispy. Turn halfway through to make sure they brown evenly. Put a frying pan on medium heat and add a splash of oil. Cook the burgers for 12 mins in total. Turn them two or three times to stop them burning (although you do want them nicely browned).TIP: The burgers are cooked when they are no longer pink in the middle. While the burgers cook, grate the cheese and loosen up the onion marmalade with a spoon. Cut the cucumber in half lengthways, remove the seeds and then chop into 1cm chunks. Cut the brioche buns in half. When the burgers are cooked, remove the pan from the heat. Carefully place the cheese on top of the burgers, followed by a spoonful of the onion marmalade. Pop a lid on the pan (or wrap tightly in foil) then leave to the side for 3-4 mins for the cheese to melt! Pop the brioche into your oven for 3-4 mins to warm. Squeeze the lemon juice into a bowl along with the olive oil (the amount specified in the ingredient list), a pinch of salt, a grind of black pepper and a pinch of sugar (if you have some). Mix together with a fork and then add the cucumber and rocket. Toss together. 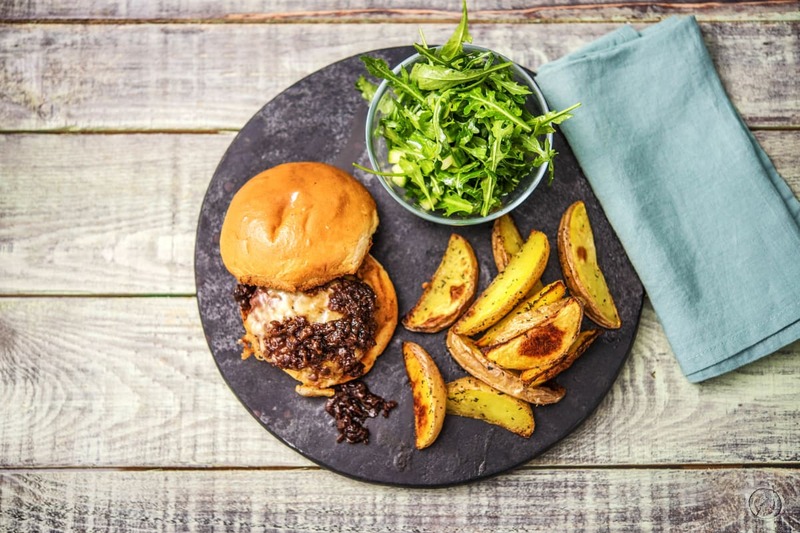 Serve the burgers in the buns, with some salad and wedges.